Wind Breaks to Protect your Plants. The most effective windbreaks are those that merely slow the wind down, such as hedges, slatted wooden fences or barriers made from perforated plastic windproof material. Solid barriers can be worse than useless as wind protection unless they are extremely high. When the wind comes up against a solid construction, it tends to whip over the top and swirl and eddy over the other side, increasing in speed in the process. 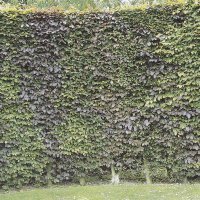 Hedges make the best windbreaks, they do, however, take up lots of space and compete with other plants for nutrients and water. Whichever windbreak you build or grow it can only protect a particular area. It is possible to calculate the approximate zone that is protected behind the windbreak by multiplying the height of the windbreak by five or possibly ten times the height. There will be some protection upto twice that distance -twenty feet or so- behind the wind break. 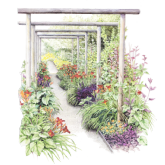 However if your garden is on a slope these figures will vary. If you plant or build windbreak it should be perpendicular to the prevailing wind to have the greatest effect. Another form of protection from the wind would be to plant a series of windbreaks over your garden. 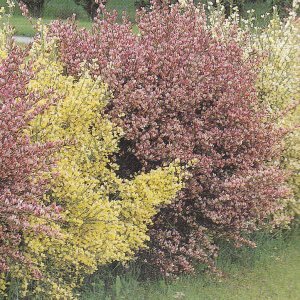 Plant attractive overlapping groups of shrubs to filter the wind as it passes through their foilage. Remember though, that even though this option could be a really attractive scheme, if poorly executed the wind will funnel between them at increased velocity.